The making of a lamp, by Christopher Spitzmiller, is an art form in which he creates timeless heirloom-quality pieces of decorating history. Christopher’s lamps are seen in the most casual to the most elegant of rooms, including the Oval Office, adding a touch of modern that is successful in any setting imaginable. In unique shapes with the most saturated gem-like glazed colors, there truly are no other lamps like his. Most interesting is the 6-8 week long process in which these sculptural and luminous ceramic lamps are made, all happening with a team of skilled artisans in his loft studio on the 17th floor of a West 35th Street industrial building. Christopher was kind enough to ‘throw’ a new lamp to show me how it all starts. Sitting at his wheel, he begins with a mass of earthenware clay. As a traditional potter does, he ‘throws’ the clay until it takes the shape and form he desires. Once he is satisfied, the piece is set to dry. In this case, producing a new lamp that is comprised of two separate pieces which are later combined to create the lamp form. He uses tools of different types, including a ubiquitous fork, to trim the pieces before they are left to be dried. 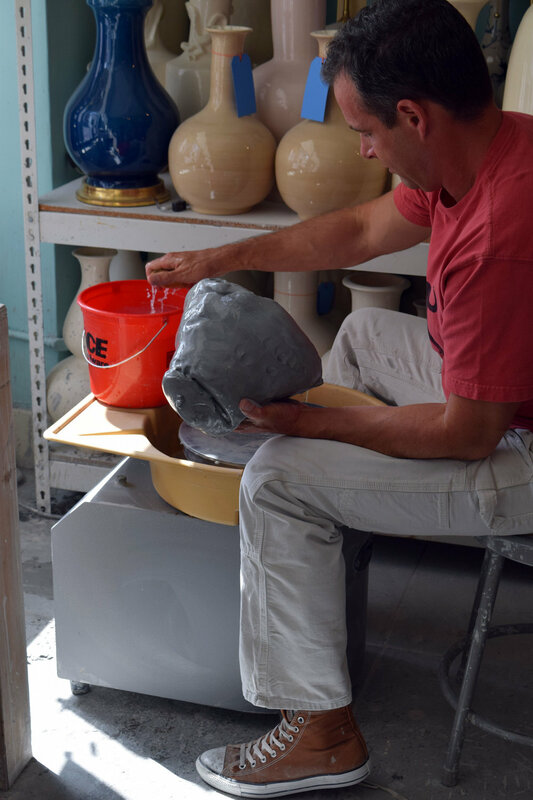 After drying, the ceramic lamps are sent to be fired in a 2000 degree bisque kiln before being glazed. The glaze is not paint – it is a liquid comprised of minerals and silicates that gives them their magical radiance. Following the glazing process, they are fired a second time in a glaze firing. Even the 2” square sample chips are made using this process. The lamp Christopher is making is intended to be a model that will be used to create a plaster mold from which the majority of their lamps are made. A lamp is typically only thrown to be a one-off design or a model for the mold. Once the ceramic glazed base is complete, each one is individually fit for a hand carved hardwood base in the wood shop. The carved base is either water gilt in 23k yellow gold or 9k white gold for a silver finish, stained in mahogany or finished in black lacquer by one of their artists after which it is paired with its partner lamp. It then awaits the gentleman who wires the lamp. 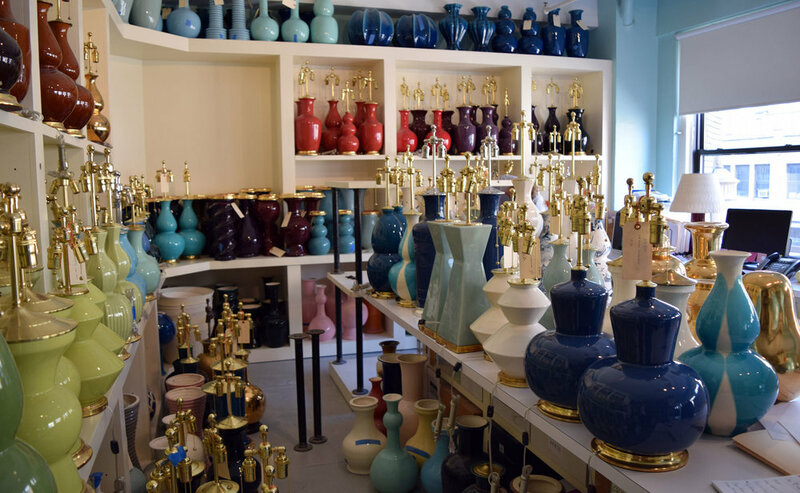 All lamps are made to order so each one is unique. 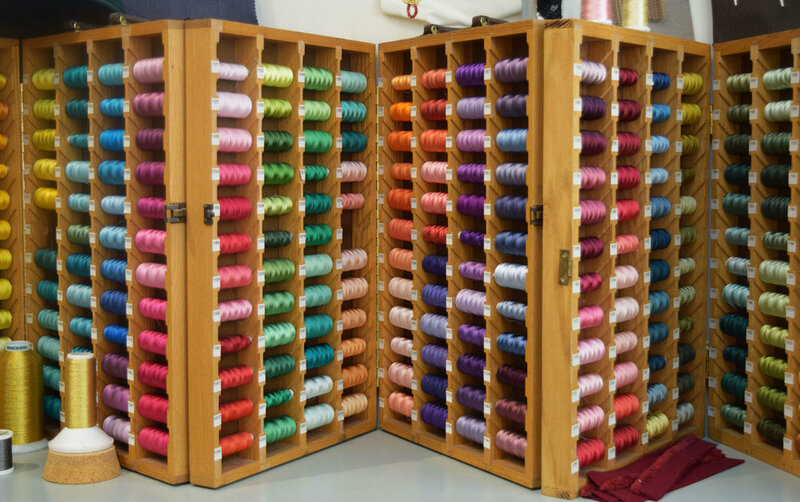 Choices include color, base finish, electrical fittings and cord colors (including red or blue twisted silk!). 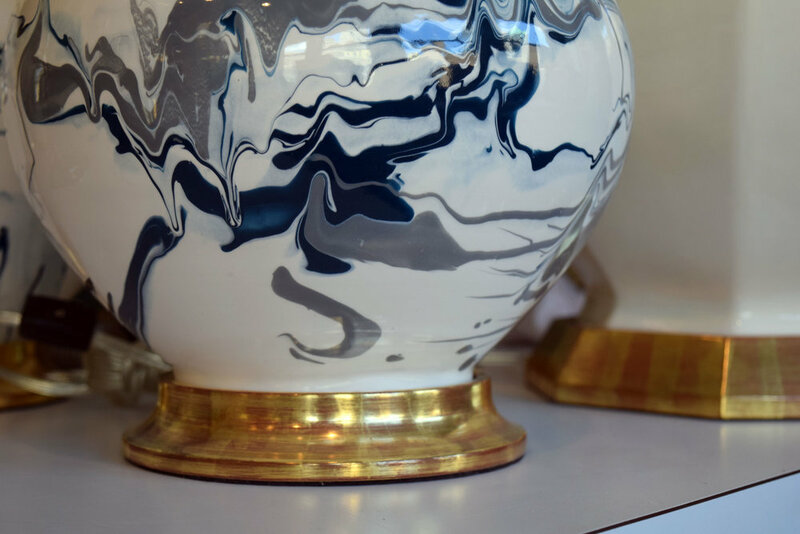 Christopher has recently expanded his prolific collection to include tableware and decorative accessories. He is truly an artist. Whatever it is he creates, it is iconic and a treasure that will surely endure the test of time. Much of the joy of what I do as a decorator is being able to work with extraordinary artisans and craftspeople. From upholstery and curtain workrooms, to metal fabricators, to wood carvers, the level of creativity and skill is always astounding. One of my absolute favorite workrooms is Penn & Fletcher in Long Island City, New York. Penn & Fletcher is an embroidery atelier founded in 1986. Most of their work is commissioned by interior designers such as Bunny Williams, Charlotte Moss, Ellie Cullman and the late Albert Hadley however they also apply their sewing techniques to costumes for the Rockettes, Broadway shows, opera, ballet and film. 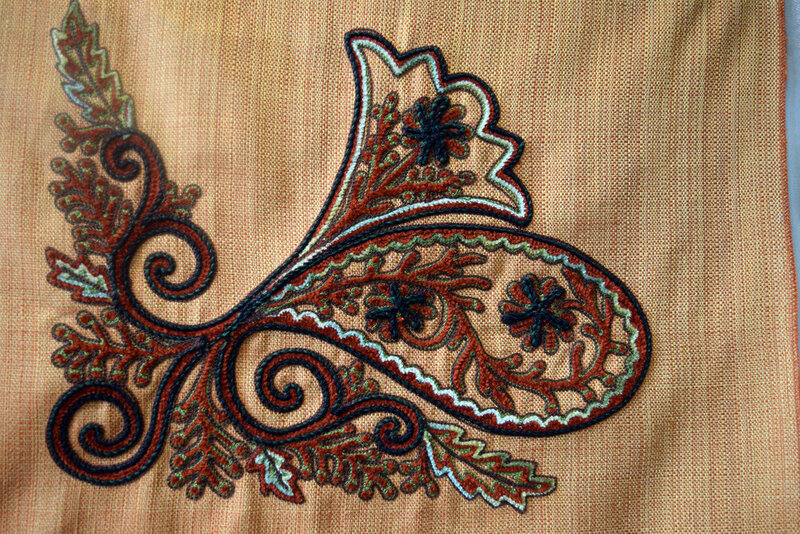 These techniques include applique, crewel, flat stitching, and ribbon work to name a few. Interior designers in particular collaborate with Penn & Fletcher (Ernie, Alex and Evelyn) to create custom designed patterns and stitches for the most magnificent curtain borders, bed canopies, upholstery, pillows and the like. Inspiration for these patterns can be derived from just about anything. Their showroom is an endless array of samples, patterns, threads and inspiration. Much time and care is devoted to the research and development of each design. Patterns are computer generated using proprietary software versions of Photoshop and Illustrator. They are then sent to the art department where the printed patterns are transferred to vellum using a perforating machine, fluorescent (cleanable) wax and black light. The complex stitching is then done by either multi-head machines, hand-guided machines or simply by hand, depending on the type of stitches desired. The more intricate patterns can be produced using multiple techniques. Laser cutting is yet another process used for creating appliques. Although very much made by hand by using centuries old processes, this embroidery is extremely technical and can also be done on elaborate state of the art machines. The result is always the same though - an extraordinary bespoke detail that will last for generations to come!